I had to check a box. With pen and paper. You know, like a box that said 18-24, 25-34, etc? Pertaining to one’s age? Well this box was slightly different, and it said 20-29. I looked at it and was like… oh, 29… that’s weird. That 9 sure does look weird there. Why does 29 look so weird? I don’t like looking at 29. I’m feeling uncomfortable. Hmmm. Hold the phone. I am 29. This is weird. It’s so weird that I can’t stop saying it’s weird. What’s happening? I’ve never been one to think or ever care about ages, but then I saw this 29 and seriously, what.the.heck. ???? It threw me off a little bit. Was I really 19 ten whole years ago? Because I’m pretty sure it feels like just yesterday that I was failing economics* and changing my major 43 times. So I made mojitos. I had almost three. Wanted to act like I was 22 again and forget that I spent an outrageous amount of money on Benefit erase paste yesterday in order to… erase things on my face. It worked. The mojitos, not the paste. To make the mango puree, combine 1 peeled + chopped, ripe mango in a food processor (or high speed blender) with the juice of 1 lime, and process until smooth (or at least almost smooth). In the bottom of a glass, add 1 ounce of simple syrup and the mint leaves. Muddle with a muddler or use the clean bottom of something blunt, like a screwdriver! 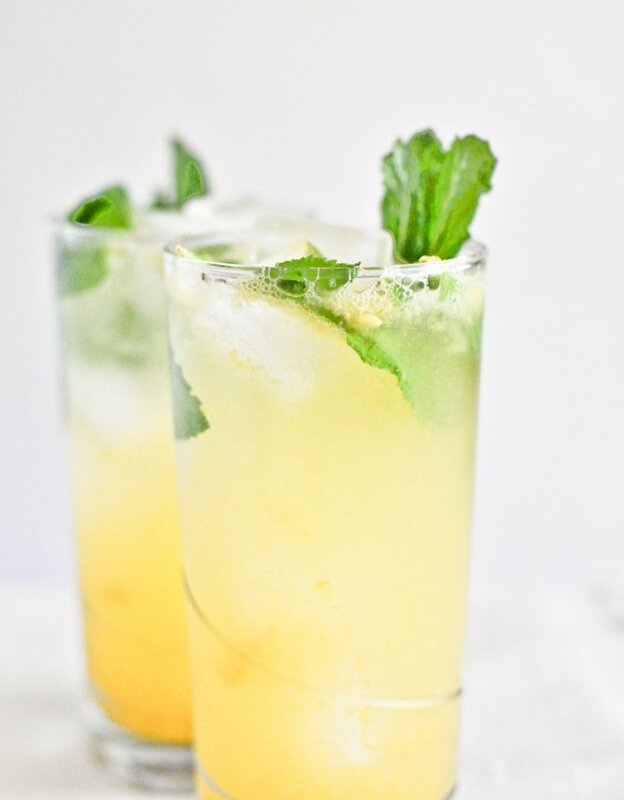 Add ice to the glass, and pour rum, syrup, mango puree, lime juice and club soda over top. Mix with a long spoon or knife and serve with an additional sprig of mint. Note: depending on the sweetness of your fruit, you may want to add more/less simply syrup, so I suggest tasting as you go. Same with the rum – add more if you like your drinks strong. Malibu also makes a mango rum that you could combine with traditional coconut rum. *Whoever tells you this is needed in real life is living in a house of lies.